Have you been thinking about joining Pink Zebra? Now is one of the best times. In direct sales history shows that the fall selling season is the easiest and the most profitable time to start your own business. Have fun introducing a new product to your friends, earn sprinkles and your favorite shades for free, make extra money for yourself, and join a team who is active with training and let’s just face it….we have a lot of FUN!!!! 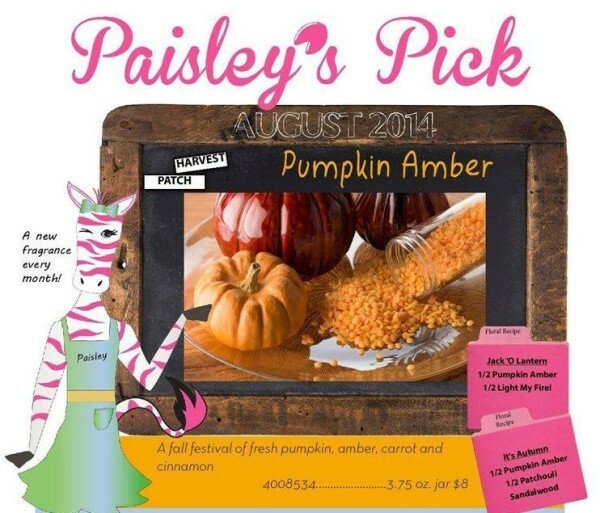 August Paisley’s of the month is Pumpkin Amber. This smells wonderful!! I have been burning this in my warmer already.